There are 110 pages for January 1906. One hundred and seven pages for February. One hundred and one pages for March. And each of those books has at least one blank page at the end. And then comes the book that slaps you upside the head — that makes you sit up and take notice. Something changed, you can’t help but think. Something big changed. And then it hits you — just what it was that changed in April 1906. April 1906… in San Francisco. Yep, The Legal Genealogist was poking around the records again, and came across the San Francisco County death reports, made and kept by the Coroner’s Office. Each sheet bears a header: Death Report, Coroner’s Office. Plus the date and a page number. The date received. Time received. Name of the person and address of the person reporting the case. The name, address and personal information of the deceased. Time of death or when found dead. Place of death. Presumable cause. When the body was received at the morgue. Whether there was an inquest and the verdict if so. An autopsy certificate. A place for a list of witnesses. The stories told by the pages are many. The mother, despondent over the loss of a child, who took her own life. The worker who fell from a windmill in Golden Gate Park. The heavy drinker who took one drink too many. The infant suffocated in his parents’ bed. The old man run down by a baker’s cart in the street. The young mother lost in childbirth. The sudden heart attacks. The deaths that must have been the reliefs from long and painful illnesses. Each death carefully documented. One by one, recorded in detail, day in and day out, one or two — at most a handful — in any given day. And then came the 18th of April. And the death records abruptly changed. 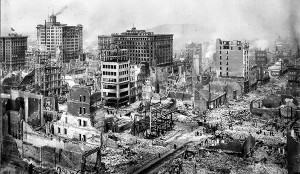 Image: H. D. Chadwick, “San Francisco Earthquake of 1906: Ruins in vicinity of Post and Grant Avenue. Looking northeast” (1906), National Archives. What a sad day! Thanks for sharing! It was sad indeed, Lauren. Hard to wrap your mind around something of that magnitude but these records sure do personalize it. That was kind of what I was thinking, Betsy. Wow. Breathtaking. A disaster swallows up personalities and even the “meaning” of a death. Sobering. “Breathtaking” is a very good word for these records, Mariann. These are just terribly tragic and heartbreaking death records. Thanks for your kindness in choosing my post, Jana, and for all you do in pointing folks to some wonderful blogs we’d not have discovered otherwise!